Travel by private jet has become an essential perk for elite PGA Tour golfers. And since October 2004 July 2004*, it has become a perk for the president of the United States Golf Association. Fred Ridley, the outgoing USGA president who will be replaced by Walter Driver when the USGA convenes for its Annual Meeting February 4 in Atlanta, spearheaded the USGA purchase of a private jet membership program. The program, although available to USGA Executive Committee members and senior staff, appears to have been purchased primarily for use by the sitting USGA president. Such programs are not cheap. A USGA spokesman could not supply details of the arrangement with their private jet supplier. However, as an example, NetJets, the Berkshire-Hathaway subsidiary that is used by Tiger Woods and Annika Sorenstam, offers a single year, 25-hour pre-paid Marquis Jet Card starting at $115,900 in a Citation V Ultra. Rates are higher for other jet types. NetJets also offers a fractional share ownership plan, which start at $406,250 for a 1/16 interest (the equivalent to 50 hours of annual flying time) in a Hawker 400XP. The ownership plan does not include monthly maintenance costs ($140,000 annually) and hourly charges (starting at $1,500). While the “Guidelines” were created 16 months ago, the private jet program and its qualification as a reimbursable expense for the Executive Committee apparently has been kept quiet even within the organization. Three days later, Parkes was able to confirm the private jet use and where it falls within the USGA's detailed expense reimbursement policy for its 15-member Executive Committee. “It was set up for two reasons,” said Parkes. “One is, a lot of the places we have to go tend to be in some very out-of-the-way locations, like the Hutchinson, Kansas's and the Bandon Dunes and other places like that. Obviously if you're going to fly from Tampa [where Ridley lives] to Bandon Dunes, that can be a very long, arduous trip if you're connecting throughout. Not accepting reimbursement for expenses was long considered standard operating procedure for Executive Committee members. Since at least 1998, the USGA has followed an extensive set of guidelines to delineate which events and meetings Executive Committee members were required to cover out of their own pocket, and which were eligible for reimbursement. Bandon Dunes hosts the 2006 Curtis Cup and the 2007 U.S. Mid-Amateur Championship. An attorney, Ridley is a partner in Foley & Lardner Real Estate Practice Group and chairs the Tampa firm's national Golf & Resort Industry Team. While rumors have circulated that Mr. Ridley used the USGA's private jet service to get to the December 8-11 Argentine Golf Association Centenary and championship, Parkes says that is not the case. But unlike staff or Executive Committee members needing approval before embarking on reimbursable travel, the president does not need prior approval to use the USGA's private jet service. It was long assumed that part of an Executive Committee members’ responsibility was traveling and participating in events to promote the USGA. Prospective members were aware of the expense involved. But access to some of the country’s finest courses--including working as rules officials at that Masters--and the respect earned for selflessness in serving the game, more than made up for the high cost of volunteer work. However, since at least 1998, the rules changed to accommodate certain expense thresholds, after which Executive Committee members were eligible for reimbursement. “[Reimbursement] basically works the same as our staff travel,” said Parkes. “We go and do the travel, we come back and submit our expenses, and if they are within the guidelines when we submit them--and this works the same way for the Executive Committee people--the USGA goes ahead and reimburses. If there is a question about why you attended that particular meeting, then they have to have demonstrated that they received proper permission from whoever their supervisor was. The president's travel expenses are subject to an appraisal by the Audit Committee once a trip is taken. Once a year the Audit Committee also reviews private aircraft usage and is responsible for assuring compliance with the guidelines. The Audit Committee is helmed by three Executive Committee members, currently chairman Fred Nelson, Paul Caruso and James Hyler. Caruso is a Vice President who was not re-nominated for 2006. As with the forty or so USGA committees, the Audit Committee reports directly to the president. The private jet use by a 501(c)3 not-for-profit organization, while not completely unusual, does mark a departure for the Far Hills, New Jersey based organization. 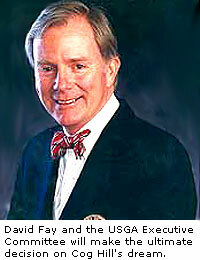 Executive Director David Fay is a notorious stickler for minimal travel expense and thorough documentation from his staff. Yet Parkes confirmed that the USGA’s enrollment in a private jet service program that requires a large pre-paid sum to guarantee minimum flight time. However, membership in such a program is not required to charter a private jet. With a significant number of hours paid for before travel plans are solidified, the USGA President is now virtually obligated to use the contracted aircraft service. * Marty Parkes has confirmed the timeline as follows: "The [Executive Committee] unanimously approved the policy of private jet travel in limited instances in June of 2004 at its meeting before the Open at Shinnecock. Everything else came afterwards. The [Executive Committee] directed the staff in June to review options for such travel and work up a contract with a vendor for the service." So the policy was approved in June 2004, went into effect in July 2004 and was reviewed and finalized at the October, 2004 Executive Committee meeting. Parkes also confirms that the USGA contracted 50 hours of flight time with Citation Shares' Jet Card program, which was used over an 18-month period. Another 50 hours has been purchased. Parkes would not confirm the cost of the jet card program. According to this March, 2004 U.S. News and World Report story reports that it then cost $84,995 for 25 hours on a five- passenger Citation CJ1. And in this October, 2003 Wall Street Journal story put the price for 25-hour cards at somewhere between $85,000 and $145,000. "The Muddying Of The Greens"